This shot of a Morecambe & Heysham Regent III shows the older livery of green with three narrow cream bands, the newer livery which had an overall cream roof and a wider centre band can be seen here. This shot shows off very well the half drop windows which I should imagine were just the thing on a hot summers day whilst tootling up Morecambe promenade. Morecambe Corporation buses did not have route numbers just the destination and this bus is destined for ‘Battery which is more or less the centre point of the Morecambe promenade between Heysham harbour to the south and Morecambe golf club to the north. When I say Battery ‘is’ I may mean ‘was’, when I researched this posting ‘Battery’ the place appears on Google maps along with the a little bed denoting ‘The Battery Hotel’ I am presuming that ‘The Battery ‘was an old military building. But on Google earth there is no mention of ‘Battery’ and all I can see is a car park I presume it is the map that is out of date. Does the place ‘Battery’ still exist or is it now just a car park if you know please leave a comment. The Battery was a large public house situated very close to the Heysham Road Depot. Buses running to the Battery would normally have started the journey at Happy Mount Park. The Battery Hotel still exists. The Battery referred to on Morecambe buses was actually a bus park across the road from the pub it was also adjacent to the Morecambe depot. A recent visit to Morecambe revealed that the site is now a Drs surgery and retail pharmacy Stagecoach run the local services in the town. In the seventies Morecambe had a municipal depot as well as a Ribble one as did Lancaster. Part of Lancaster’s municipal depot is now converted into upmarket apartments called The Old Bus Depot! I believe that before Morecambe was developed as a holiday resort and expanded accordingly there was a firing range on the sands between Morecambe & Heysham with the Battery Hotel taking its name from an artillery battery which had been sited nearby. The bus park across the road took its name from the pub, which still gives its name to a timing point on the local bus network although a medical centre/pharmacy now stands on the site of the Battery Bus Park. The Battery is the boundary point between Morecambe & Heysham which were separate local authorities until 1928 when Heysham Urban District and Morecambe Borough Councils merged, the Morecambe & Heysham Corporation bus depot which was a couple of hundred yards south of The Battery was therefore in Heysham. Morecambe were still running over 20 AEC Regent IIIs when they became part of the enlarged Lancaster fleet. Interestingly Morecambe were the last operator to run petrol engined double deckers they were certainly in use in the fifties. Also some of Morecambe’s pre-war double deckers had retractable canvass roofs for sunny weather a feature I would venture to suggest were unique unless anyone knows different . Actually the Battery was a field artillery station, when Morecambe was a training depot for the army in the late 1800s. The Battery hotel is named for this reason. Yes Chris, the pre war Regents had roll back canvass roofs from the 1936 Park Royal batch up to the last pre war deliveries. These were panelled in during WW2. The relevant Park Royal bodies had an almost vertical rear dome to accommodate the roll up. I could never understand, as a youngster, why this was so different to the standard PR rear shape! There were some really unusual sounding destinations too, Bare, Happy Mount Park, Heysham Towers as well as "Battery" spring to mind. The canvas roofs were not unique to Morecambe double-deckers – in fact they were a short-lived fashion with coastal operators in the early/mid thirties, when they were of course very common on coaches. Southdown certainly had some Short-bodied TDs of this type, one of which I believe still survives. And not just coastal operators. Cheltenham & District had a couple of them for some inexplicable reason! Perhaps for the Cheltenham (Gold Cup) Festival? As youngster I travelled on these buses regularly in the 1950’s. They were always immaculate and looked very smart in their green livery. During the early 1980’s one restored bus, fleet no.69, LTF 254 ran on the promenade Happy Mount to the Battery service during the summer only. Does anyone know what happened to this bus? 20 JTE 546 and 35 KTF 594 were advertised for sale by Quantock Motor Services in Somerset back in Jan 2011 – where are they now? Nothing really to do with buses but the mention of Bare reminds me that in the 1950s my grandparents and I always visited Morecambe for the Illuminations. We always came on a Yorkshire Woollen excursion and the coach always stopped for a refreshment stop at Ye Old Naked man at Settle. My Grandfather always cracked the same joke saying that the man lived at Bare. The premises are still at Settle but I don’t think that many coaches stop there these days. At the risk of being accused of wandering ‘off topic’, there were (are they still there?) two establishments in the eastern part of Morecambe called the Bare Tennis Club and the Bare Women’s Institute, causing some merriment to visitors. I attended Morecambe Grammar School’s 6th form in the mid 1960’s, and several of my classmates hailed from the White Rose county. They called Morecambe "British West Bradford"! Re the diversion to the Bare district of Morecambe, I once read or heard that Morecambe Corp would run a fast duplicate service to that area, leaving the regular service for more local people. At the starting point, the conductress on the duplicate would apparently call out "Bare people only on this bus"! Whether that’s just someone’s made up story, or actually occurred, I know not. …..but it’s worth the telling anyway. Couldn’t bear to miss it. Shades, Michael, of the "Loose Women’s Institute" in Maidstone !! Morecambe’s petrol engined AEC Regents were still running until at least 1965 as open toppers. I worked on them then as a conductor during that summer after leaving school. As they were only 7′ 6" wide, collecting fares with standing passengers was a nightmare! The pre war Morecambe fleet was a classic collection of thoroughbred AEC Regents, with beautiful Park Royal or Weymann bodies, and they are engraved on my childhood memory. All were new with petrol engines, and the post 1936 Park Royal examples had sliding sun roofs, panelled in during WW2. a few survived as open toppers, as described by David above. There is a fleet list on this site to whet your appetite, which also covers Lancaster Corporation. I just wish that I had taken photographs of these buses, as it was this fleet, during my early childhood, which cemented my interest in buses. I realised at an early age, that buses came in different, but subtle shapes, and that our home fleet in Bradford had some of identical pattern (Weymann). If anyone knows of a photograph source for this pre war fleet, then I would love to know. Another fascination was the haphazard, gap filling fleet numbering system, only just recently unwound in my mind thanks to the fleet list submitted by Dave Towers, for which , many thanks Memories! Well John, Sheffield were past masters at haphazard gap filling with the fleet numbers and with routes numbers. Possibly a bit biased, but I always preferred Sheffield to Manchester but I have to say the Manchester numbering system was always far better and more logical – 1000s and 3000s for Leyland, 2000s and 4000s for Daimler and blocks of route numbers for routes leaving the city down a particular common corridor. John If you can get hold of the Lancaster 75th anniversary brochure from 1978 you will find several shots of pre-war Morecambe buses including one overturned on the foreshore. The brochure can be obtained via Amazon. There is also a Super Prestige paperback album about Morecambe and Lancaster buses. Thanks Chris…I have both those publications, and also the "Morecambe Bay Buses" of c. 1978. The Super Prestige one is well worth having if you are a fan of either Lancaster and/or Morecambe. I just love the pre-war Lancaster "English Electric" flavour too! Bus shapes very similar to the Bradford Regen trolleys I was brought up with! Picking up David’s point, Manchester’s fleet numbering system was certainly a model of neatness, but its rationalisation of route numbers into corridor blocks was not without its critics. It has been suggested that it was far easier for passengers to remember the difference between 50, 64 and 161 than between the 41, 44 and 45 that replaced them. Other than for a couple of brief breaks I lived in Morecambe from late 1958 up to 1982 and am therefore able to confirm/correct some of the above. A bus coming along the promenade showing ‘Battery’ may indeed have come from Happy Mount Park, or it may have come from Central Pier. M & H were famous for sending spare crews out doing ‘promenades’, i.e. extras between the Battery and Central Pier – even when there was no earthly need for them! The turning arrangement at Central Pier was to back into a side street (Clarence Street I think it was called) – it would never be tolerated these days. Buses also terminated at the Battery on the so-called ‘Circular’ service, i.e. Heysham Village – Battery – Promenade – Bare (Princes Crescent) – Torrisholme – Euston Road – Battery. 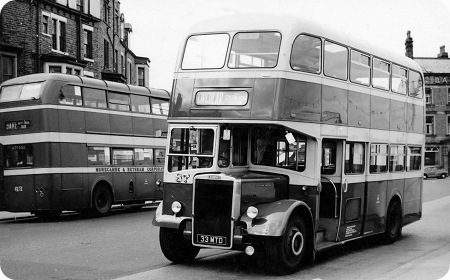 After the arrival of the Leyland PD2s in 1960/62, they were the usual performers on the route. I wouldn’t say that the Battery bus parking area was ‘adjacent’ to the depot – the depot being a full bus stop distance away. Don’t remember a firing range on the sands, but had there been one I probably wouldn’t have remembered it anyway. I haven’t previously heard that the boundary between Morecambe and Heysham was at the Battery, or that the bus depot was in Heysham, but I’ve never been too sure where the boundary actually was so I’d better abdicate on this point. I feel sure that the restored Regent III which ran on the promenade in the 1980s could only have been number 20 (JTE 546). Number 69 (KTF 254) was sold to the Mersey & Calder Bus Preservation Group in the late 1970s and is still, I believe, in preservation at present. KTF 594 was fleet number 65 while with M & H.
I think that few people who have stopped for a break at Settle and parked in the car/coach park – even bus enthusiasts – will have realised that there is a bus depot located there. It certainly doesn’t stand out. I think, Pete, that you have mentioned elsewhere that you attended Morecambe Grammar School in the 1960s. I did a full seven-year ‘stretch’ (1960-67) and I sincerely hope that your own experience of the place was significantly more positive than my own. This is perhaps a long shot, but did you happen to be a pal of one of the Mollitt twins? I wouldn’t be able to remember which one, but one thing I can remember is that they had forenames with the same initial letter – James and John I think. Never known non-stop extras to Bare, I think that story’s apocryphal. Morecambe’s last two pre-war Regents, 25 and 49, last ran, I think, in the summer of 1966, but they were diesel-engined by that time. I believe the conversion was quite late – possibly c1960 – by which time they were the only survivors. They were converted to open-top in time for the 1962 season, having been made surplus by the arrival of PD2As 90 and 91. When they were converted I believe the original gearboxes were retained, and as a diesel engine is much slower-revving than a petrol this made them hopelessly undergeared. I’ve heard that the drivers called them ‘two-gear’ buses – which would mean either second then top, or perhaps third then top. Mention of petrol engined open-top Regents running until 1965 was a little off the mark. The last petrols (enclosed deckers) ran after the 1959 season, new Leylands replacing them the following winter. Two petrols had been converted to diesel after the war – these engines subsequently getting switched to ‘newer’ examples, and it was these which became open-topped from 1962 lasting till 1967 by when some Regent IIIs had been cut down. Open top 65 and enclosed 20 were sold by Quantock late in 2011 passing to Ukraine, 65 known to have been put into use at Sevastopol in red as "London Bus Cafe" (what else!). Last November John Hewitt and Daren Hunt bought MTE 635 from Ken Wade. Hopefully back on the road in 2 years time. Here is a difference in livery for Morecambe & Heysham Corporation the old as depicted on fleet number 63 in the background and the new on the Leyland Titan PD2 fleet number 87 in the foreground even in black & white the new livery looks more attractive. The colours by the way were a darkish green and cream. Morecambe & Heysham had a tendency to get there money’s worth out of there buses and kept them a little bit past what other operators would regard as there sell by date, luckily for us bus enthusiasts (more photos to follow). The PD2/37 coding breaks down as follows:- exposed radiator, synchromesh gearbox, air brakes, 27 foot long by 8 foot wide and built 1955 onwards. I do like the sliding doors but they never really caught on, why not? If you know, let me know, please leave a comment. The only sliding doors I ever experienced (on North Western Dennis Lolines and Lancashire United Guy Arab Vs) were air operated. This meant that they were moved by an accelerating force rather than at a steady speed as they would be by an electric motor. Being quite heavy they were slow to get moving, and then moved faster and faster, eventually shutting with a massive thump. I would not like to have been in their way. You will be pleased to know that one of the Weymann-bodied batch 73 (MTE 635) survives at Keighley Bus Museum, where its owner Ken Wade is valiantly battling to replace about four tons of rotten steel and wood! Steel + wood + salt = bad news! As far as sliding doors go, I concur with Peter: they were always sluggish in operation, and from the Green line "Q" double-decker to the SHMD short Fleetlines they were always troublesome. One reason must be sheer physics: one big door has to be made quite rigid and is therefore very heavy, so it needs a lot of power to get it moving (unless it’s manually operated when it’s murder for the conductor!) Secondly, the single door leaf has to travel further to close the opening -about four feet as opposed to the one-foot movement required of a jack-knife door leaf, so it just takes longer to shut. On a one-man bus they were worse still, because there was often an interlock to prevent the gears engaging until the door had closed, so they increased dwell times at stops and hindered time-keeping too. For the record, the twin-sliders on SHMD centre-entrance buses are electric, and they’re fairly quick, but still slower than the jacknife type. Sliding doors were common in this area; I’m 99% certain that Ribble’s full-fronted PD3s had them and also Lancaster City Transport’s PD2s, (201-206). When Southend Corporation purchased some ex Ribble deckers with sliding doors they were nicknamed Bacon Slicers. I recall that they tended to be slow to close and then speeded up and closed with a bang. I recall that Yorkshire Traction had a batch of PD3s with sliding entrance doors. It must’ve been a regional thing because as a kid in the 1960s sliding doors were quite common where I lived. Arriva Yorkshire’s newish reputedly hi-spec Volvo/Optare Double Deckers rattle constantly: although you could sometimes put it down to driving style, the noise seems to come from the folding front doors. So is it back to sliders? All Yorkshire Traction’s Northern Counties and Roe bodied PD3’s had sliding doors and the description of that accelerating door followed by a solid thump was just as bad east of the Pennines as it was in Lancashire, very hard to set up perfectly. The only exception on PD3’s they had were the two ex County Motors vehicles, these had traditional (as opposed to Park Royal style) bodies with jack knife doors. The advantage of the sliding door though was that it maximised the width of the door aperture meaning that you could easily achieve a double flow of leaving or entering passengers to both saloons simultaneously whereas the jack knife type tend to narrow the doorway a bit. Morecambe and Heysham Corporation was the catalyst which got me hooked on buses when I was about 3 years old. in the 1945/8 period. I recognised the similarity of Weymann body to those of my home town Bradford fleet, and the dis-similarity of the Park Royals. This was in the pre Mk III days, and one had a real job to recognise fleet numbers as they were all over the place on the pre-war stock, filling voids for withdrawn buses. Anybody got a fleet list of the pre-war Regents and the single Regal? What a super green livery too…I cannot believe I am talking about 60 odd years ago! John, I have a M & H fleet list of every bus the undertaking owned. If you are still interested contact me through the website. Here I am again on about Southdown but they did have a batch of PD2/12’s No’s 799-812 with East Lancs bodies plus one earlier Guy Arab with Park Royal body No 547 (thankfully now preserved) fitted with sliding doors on rear entrance bodies. These were different in as much as they were in two parts which with some, to me unknown, mechanical trickery slotted in between the rear wheel arch and the normal width platform. They were still very slow in operation and being electrically driven struggled manfully when facing up a steep hill, the driver was well advised to press the open button a little in advance if possible. I have only recently discovered your wonderful site and I am have fun exploring it, so I hope you will excuse my ramblings. Ramble on as much as you like, along with the rest of us! I don’t know where they were based, but seem to recall seeing one or two on route 31 around Portsmouth. However, Southdown had similar bus bodies made by Park Royal, Beadle and Northern Counties et al, and you had to look closely to tell the difference. Can’t recall whether they all had doors, though. I was distracted with girlfriends around this period! Welcome to the club, Dave, and, as Chris says, ramble on – from another David with diesel in his blood. Well Chris and Dave – not sure which was the greater distraction, but the Southdown PD2’s were great machines, even if I only sampled them as a teenage passenger! There were 112 of them (on PD2/12 chassis), the first 54 with Leyland bodies. The initial 24 were without doors on delivery in 1951, but soon had them fitted, and all the rest were delivered with doors. Then came 10 with Northern Counties bodies, and the rest were bodied by Beadle, Park Royal and East Lancs. As Dave says, some had sliding doors, although most had 4-piece folders. Until the PD3 Queen Marys came along from 1958 onwards, these were Southdown’s front line machines not only on the 31 to Brighton, but the London Road services out of Portsmouth to Waterlooville and Petersfield too. Before the Queen Mary’s took over everything in sight (as it seemed by 1965 onwards), the PD2/12s were nicely intermingled with earlier PD2s (80 of these also Leyland bodied)and PD1s (a mixture of Leyland and Park Royal bodies), and the surviving rebodied pre-war TD4s and TD5s. I loved the sound of a pre-war Leyland TD engine, and was sad to see the last Southdown one go in 1962. But the sound lived on in Portsmouth Corporation’s four open-top TD4s, and in their "Leylandised Crossleys" (as the local drivers called them). These survived until 1967, and the open-toppers until 1971/72, and all 4 still survive in preservation. Barton’s Northern Counties bodied Regent V’s, plus there own rebuilt Leyland deckers all had sliding doors including the UK’s lowest height Dennis Loline which was at the 1960 commercial motor show. Roger is right – all of those rebuilds had single piece sliding doors. The earlier PD1s with Duple front entrance bodies had twin doors, and from memory they were usually fairly gentle in operation. There were conductor or passenger operated "open/close" buttons above the doors (i.e. they were not under the control of the driver.) In warm weather they were often left open – none of this Health and Safety nonsense, and after all the other 70% of deckers had open rear platforms anyway! When in the 1940s I used to stay with my gran who lived in Ingleborough Road we would take the bus to Morecambe. The bus used to detour off the main road and go through Torrisholme where I was always fascinated by a a large Italianate coloured statue in a garden which could be seen from upstairs on the bus. I wondered if it is still there or if anyone else remembers it. My mum, Hilda Wilson, used to be a bus conductress on the Morecambe & Heysham buses and she and the other women (except one) could only work on them in the spring and summer. The lady who was allowed had worked on them before the war. There must have been some rule that prevented them. My mum used to have to finish before winter and start again the year after when the weather got warmer. More often than not, Lynne, it was the unions who objected to conductresses continuing after the war. I suppose your mum worked during the Summer Season, when services were augmented for the holidaymakers. I think that – for all it’s weaknesses (slow to operate, yet forceful when opening/closing [I understand that the repeated slamming when closing caused structural problems in the front near-side bulkhead]) and strength (unrestricted entrance/exit area) – the sliding door just came too late: the advent of the rear-engined/front-entrance double-decker killed it off (sliding door ahead of the front axle?) . . . apart from those strange dual-door Fleetlines supplied to Walsall and SHMD. I am replying to Lynne’s comments about conductresses on Morecambe’s buses. I was a seasonal conductor (student) in the early 60’s working about 3 months in each of four successive summers (remember those?!) and recall three full-time conductresses : Mrs Fisher, Mrs Camm and Ms Higgins. I have vague memories of your mother also Lynne (Mrs Wilson). Another conductress, Mrs Bell worked every year from Spring through Summer. Her husband was a full time driver and they were often rostered together. Unlike the many students who wore lightweight summer uniforms Mrs Bell was attired in full regular uniform (navy blue). They were years fondly remembered and all of my colleagues were tremendous characters – even the inspectors! Keith, you may find this a funny question, but have you lived in Market Deeping? Well David – how right you are! Yes I did live in Market Deeping and I needed to get the abacus out to calculate when! I was there for about 6 years and left in 1988 or thereabouts. I now live in Peterborough and in my retirement I make ‘guest appearances’ for Stagecoach locally driving on city routes. What’s our connection? I used to know a lad in Heysham (I lived in Morecambe at the time) who, in the 1970s (and possibly longer, of course), kept in touch with you. It’s a small world, bus enthusiasm – everyone knows everyone else, if only indirectly. Thank you David for enlightening me! It brought back memories of CH and his involvement with M & H TD’s unique No 72 (MTC 540) which was stored in the open at Steamtown, Carnforth in the late 70’s. 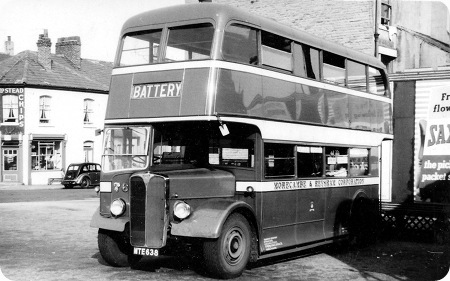 This bus was new to Morecambe in 1950 and came directly from the Earls Court Commercial Vehicle show in that year. It sported original dark green livery then. The vehicle, an AEC Regent III, was the last of Morecambe’s pre-selectors and was fitted with a larger engine than its sisters. The bus is currently undergoing restoration. I conducted No. 72 many times on the Carnforth route – a service jointly operated with Ribble. The ‘middle Carnforth’ duty (12.53 – 20.27) was a particular favourite of mine. The conductor’s place on the platform was draughty and cold (even in summer) with winds coming straight off the Bay. The driver’s turn of speed through Hest Bank and Bolton-le-Sands didn’t help either! I was told that this was the reason that AEC Regent V No. 84 (793 ATD) was fitted with rear platform doors under the control of the driver for use on this service in winter. Unfortunately he often forgot to open or close them! No.84 was the only bus in the fleet fitted with rear platform doors. Returning to the original subject of this posting (Leyland Titan PD2/37 No. 87) I conducted this vehicle and its two sisters many times on the "Circular" route. After the relative ‘seclusion’ of rear-entry vehicles I found that standing at the front under the perpetual gaze of the passengers was somewhat unnerving! However I recall conducting this vehicle one Sunday morning in the 60’s for the ‘nurses special’. This involved gathering up these fine ladies early morning from the Queen Vic Hospital in Thornton Road presumably after working a night shift and taking them home. We did not operate over any recognised bus route but I think we went along the Promenade and Broadway at one point before starting conventional Sunday services. Keith, thanks for the interesting recollections of the Carnforth route. Now please correct me if I’m wrong, but wasn’t it linked with Overton at the other end? I believe the route went through Middleton (well I suppose it would have to do!) and then down a fairly lonely stretch of road into Overton, maybe turning round in a pub car park, where the landlady was well known for her collection of eggs. End to end I expect this would have taken at least an hour, perhaps venturing into the bus station rather than directly along the prom. Keith was a seasonal conductor with M & H C T D in the early 1960s, and the Carnforth buses didn’t start running through to Overton until the late 1970s, i.e. in consequence of the so-called ‘agency agreement’ whereby the purely local services of Ribble and (by then) Lancaster City Council were considerably recast with the operators having their agreed running costs guaranteed by Lancashire County Council, who, presumably, became the people who were required to ensure that public transport paid its way. Although both the Carnforth and Overton routes had previously been operated jointly (Ribble/Council), after the agency agreement came into effect the combined service was operated solely by Lancaster City Council. Conversely Ribble began to run some services which had been purely Council-operated. The round trip time on Carnforth-Overton was two hours, and yes, it is my recollection that the service diverted via Euston Road, but not actually going into the bus station (which may or may not have existed by that time, I’m not sure now). By the time of the above changes the terminus at Overton had moved from the pub car park (‘Ship’ hotel, was it?) to a new turning circle at the Middleton end of the village, which I presume still exists. These so-called ‘agency agreements’ were widespread but within a few years bus deregulation came along, this the County Councils were generally opposed to (they weren’t the only ones, of course) because it effectively undid the work they had done over the previous decade or so coordinating bus services. Herewith a reply to Dave and David! The Overton service in the early 60’s started from and terminated at the Battery. Anyone wanting to travel to Carnforth from Overton would then have had to take three buses! Many of the drivers at the time would have loved to operate such a ‘long’ route. It did come as David points out – but sadly too late for these fine gents. The landlady of the Ship Inn, Overton was "Ma Macluskie" – a larger than life character who wore a very wide ‘brimmed hat and had a loud laugh! As correctly stated it was the conductor’s job to see the driver back when doing an offside reverse into the pub car park. The road from Middleton Corner was indeed narrow and winding and without bus stops (no ‘hail and ride’ in those days). Unusually this fare stage cost 3d to ride (as did the other service from this point to Middleton Tower Holiday Camp [Pontins])- all other single fare stage rides in the Borough were only 2d! In the later 60’s when I had moved away the Overton service evolved into a convoluted circular route by grafting it on to a town circular taking in Regent Road, Westgate, the Branksome estate, Euston Rd Station (ERS), Promenade and Westgate again! I remember with a shudder my first time on this Westgate service which had been omitted from my route learning! I had No 84 bus (AEC Regent 5 with rear-platform doors)on a very busy wet market day and with the doors closed all the windows steamed up and I couldn’t se where we were! I received what busmen call ‘a hammering’ and had no time to alter the rear indicator blind which showed blank for most of time! Ribble did operate an Overton service but I’m not sure how it got to the Battery – via the Promenade or via ERS. It was relatively infrequent then -rather like their L14 to Bare. Thanks Keith for your recollections. I don’t imagine that residents of Overton would be too impressed at being deposited at the Battery, on the edge of the town and some distance away from the majority of the shops! I’ve just dug out an old BBF 16 (Ribble) to have a look at the local services. There was an L11, Lancaster to Overton service run, it is claimed, jointly with Morecambe and Heysham Corporation. In all my years of living in Lancaster I can honestly say I never saw a green M&H bus in Lancaster bus station (even after the University service started around 1966) so the actual operational side must have been, I reckon, all provided by Ribble. With regard to David’s posting regarding the ending of the Agency Agreement at deregulation, I can remember a time around 1988 when LCT and Ribble were competing vigorously on the Heysham to Lancaster University services. The timetables on these services changed, it seemed, every few weeks, with each operator moving their schedules five minutes in front of the other on a regular basis. I could swear that it wasn’t long before they went all the way round the clock with it! I’m fairly sure that between them they had something like six buses an hour chasing each other around even on Sundays, a terrible waste of resources. As you will know though, eventually some kind of truce was arrived at (I think in 1989) with both operators negotiating an agreed network which showed a lot more common sense, so this sort of agreement must have been permitted under deregulation. Thanks Dave. The only time you might have seen a green M & HTD bus in Lancaster in the 60’s was around midnight when a mechanic would take the late shift workers home (those without their own transport! )However even then I suspect it would have been a rare occurrence as the driver of this bus would be very reluctant to go there and would have tried his utmost to deposit any bus employee living in Lancaster as near to Torrisholme as possible! The Overton service more than likely followed the L6 Ribble route to Heysham (via ERS, West End Rd, Westminster Rd and Battery). No ‘green’ bus operated beyond the Battery from points further out than ERS. I have a fare table dating from 1961 showing a service to Higher Heysham (Harbour Gates) from ERS. However I think this was probably a workman’s service and in my four years there the only time I operated a green bus this way was a football special from Christie Park to Heysham. We did not have a fare table for this entire journey and I remember guesswork being the order of the day for the those riders (the majority) wishing to travel beyond the Battery from Christie Park! Similar situations could arise on a very occasional basis elsewhere and usually a paper sheet showing the fares to charge would be provided by an inspector if one was to hand. On the above occasion I had to ‘go it alone’ however. Happy memories! Dave T: Such agreements were certainly not permitted under deregulation. The Monopolies and Mergers Commission would have taken a very dim view of any agreement between operators, and Traffic Commissioners had powers to reduce or revoke licences. It was generally the case where this sort of competition did not result in one operator gaining a significant advantage over the other that both operators found that there were some routes where there was no gain from continuing to operate, and withdrew, leaving the other in possession. This would normally be a common sense business decision, resulting in what looked like a common sense division of the traffic. Any suggestions that the respective Managing Directors had happened to bump into each other in a pub a few weeks earlier are of course entirely conjectural. Just to add that Morecambe & Heysham No 77 does of course survive as well as 73 and in spite of everything is still road worthy. In fact if it hadn’t been so late I would have taken it a quick spin last night but I was a bit tired! Does anyone know what’s happened to No 20, JTE 546 since it was advertised for sale? The Battery Hotel is now closed and boarded up, My father worked for MHTD for over 30 years and stopped when the brought in 1 manning. The "Terminus" at the "Battery" was the plot of land opposite the Battery Hotel, the land is now a "Health centre". And regarding a previous post regarding the "Border" of Morecambe and Heysham!! There used to be a post office between Stanley and Sefton road on the seaside of Heysham Rd next to a "Chippy" and had a "Zebra crossing" when I was a kid I was told that the "Border" was the "Zebra crossing. The crossing has now moved to the Battery. I only found this web site by chance when trying to establish if the Trans – Pennine run still takes place on the first Sunday of August. Having lived in both Lancaster and Morecambe until January 1962 when the family moved to Peterborough I found the articles on both undertakings of great interest. I happened to visit the area only last Wednesday with my father (now 91)to see how much he remembered. The Morecambe / Heysham border was of particular interest because my grandparents had a boarding house at 201 Heysham Road, directly opposite Rydal road and thus with a sea view. To give my father chance to look directly at the property I seemed to remember my grandmother saying that hers was the last house in Morecambe and that no. 203 was in Heysham. That would appear to be incorrect given the earlier comment. I was always interested in transport (subsequently spending an enjoyable 40+ years in the freight industry) and whilst I have scores of old photos from the 50’s and early 60’s these are all of trucks rather than buses. I believe I have 1 odd bus photo (if I can find it) of a Leyland pulling into the bus station from Damside Street but unfortunately no story to go with it. Does a list of what was on the destination blind of M&H buses exist anywhere? Massey sliding doors were a victim of the usual British half cab/forward entrance body weakness found on just about every other chassis and body combination on such vehicles. The Massey sliding door fitted to forward entrance PD2s (we had 4 of these at Baxter’s in Airdrie) would occasionally slide out of its runners, due to the amount of flexing in that area of these buses. It was therefore the case that the sliding door would rarely fall off the vehicle onto the roadway. All of Baxter’s Massey bodied PD2s were of lowbridge configuration and the forward entrance examples made for interesting contortions by those of us who were employed as conductors. They were well liked by the drivers for their turn of speed, and ease of driving compared with the various Bristol Lodekkas we had in the fleet, which was under control of the SBG Eastern Scottish company when I was there. Andy there is a book called ‘Morecambe and Heysham’ by a Harry Postlethwaite. This has a fleet list in and is the history of MHTD Isbn number 978 190530 4424. My dad was a bus driver in Morecambe, in the 1970’s (Ribble, not Corporation). Orginally there was a tram route between Morecambe and Heysham, and when drivers got a shift on that service they still said they were "on track", presumably from the days when the old tramlines were still in the road. Does anyone know if they still say this? Vaughan, the entire Lancaster-Morecambe-Heysham route (L6, later 570) was always known to Ribble crews as ‘the track’. I believe there are or were other operators (Midland Red is one of which I am aware) who also had a ‘track’. I’ve not previously heard the suggestion that the term arose from the existence of tram tracks, and don’t know what to make of the idea really. As far as I am aware trams never operated between Lancaster and Morecambe – electric trams ran locally in Lancaster, horse trams in Morecambe, and petrol trams (I believe) between Morecambe Battery and Heysham (it may have been to the Strawberry Gardens, I’m not sure). I worked at Ribble’s Morecambe depot through most of the 1970s (as a conductor, and later driver) and knew your father well. The famous West Riding route 10 from Wakefield to Leeds (now 110) was (is?) known as "the track" and replaced (and even tried to imitate) the trams along this route. Some interesting thoughts here about the origins of "The Track", as it relates to the Lancaster & Morecambe area. I have – but it’s hidden behind a pile of stuff that normally lives under the model railway, while I do some major work on said model – an early 1900’s map of the area, and it does show SOME tram tracks. I’ll have a look to see if they did or did not run cross boundary. www.old-maps.co.uk has a 1913 1:2500 OS map which shows a tramway which can be traced from the Lune Bridge through to Morecambe where it terminates by going round the Euston Rd/Market St?? ?/Cheapside/Moss Lane block, there is no indication that it is 2 tramways meeting end to end at the boundary. It does not appear to connect with the sea front tramway. My ‘initiation’ with Midland Red, after route learning was ‘The Track’ – service 201 Smethwick to Worlds End. It was almost some sort of sadistic punishment, a D5 (no power steering) and 18 islands within some 5-6 miles! This was supposed to be shared between Digbeth & Bearwood garages. I still believe I was the only one from Digbeth, my arms hurt as I write! I’ve unearthed the book of maps. I can confirm that the Lancaster & District (horse-drawn) operation did cross the boundary at Torrisholme and it terminated in Market Street, Morecambe. The notes to map reference 434638 say that there was no connection with Morecambe Corporation’s (horse-drawn) operation along the seafront. Huddersfield services 370/1 between Lindley and Dalton/Rawthorpe are still known as ‘the track’ – maybe to do with the former trolleybus services on this route. I can’t now remember the Midland Red route I saw referred to as ‘The Track’, but I’m sure it wasn’t Smethwick to Worlds End. I think it’s likely that every significant depot would have had its own particular ‘track’. The Midland Red route I remember being referred to as ‘The Track’ was the B87 Birmingham to Dudley via Smethwick and Oldbury, but as you say, David, there were probably others. For research purposes does anyone know why Morecambe & Heysham stopped their 40 year ‘nothing but AEC’ purchasing policy in 1960 when they bought the first of five Leyland PD2s?? I believe it was caused by the retirement of one Manager and the appointment of his replacement. Others may have a closer working knowledge of what happened in M&H. I was in Lancaster, and the two Councils didn’t "get on"!!! Leyland were always very persistent in pressing their claim to supply local authorities in Lancashire. I suspect they may have had a special campaign to drum up extra business round the end of the 50s. 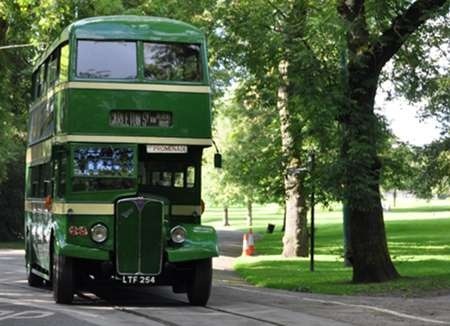 Even Nottingham, whose only previous experience of Leylands was 30 TTB3 trolleybuses in 1935, took 44 PD2/40s in 1958/59. There must have been some serious inducement to break with the tried and tested AEC Regents.